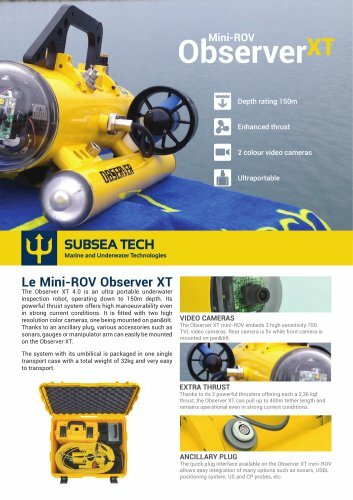 ObserverXT Mini-ROV Depth rating 150m Enhanced thrust 2 colour video cameras Ultraportable SUBSEA TECH Marine and Underwater Technologies The Observer XT 4.0 is an ultra portable underwater inspection robot, operating down to 150m depth. Its powerful thrust system offers high manoeuvrability even in strong current conditions. It is fitted with two high resolution color cameras, one being mounted on pan&tilt. Thanks to an ancillary plug, various accessories such as sonars, gauges or manipulator arm can easily be mounted on the Observer XT. VIDEO CAMERAS The Observer XT mini-ROV embeds 2 high sensitivity 700 TVL video cameras. Rear camera is fix while front camera is mounted on pan&tilt. The system with its umbilical is packaged in one single transport case with a total weight of 32kg and very easy to transport. EXTRA THRUST Thanks to its 2 powerful thrusters offering each a 2,36 kgf thrust, the Observer XT can pull up to 400m tether length and remains operational even in strong current conditions. ANCILLARY PLUG The quick plug interface available on the Observer XT mini-ROV allows easy integration of many options such as sonars, USBL positioning system, US and CP probes, etc.